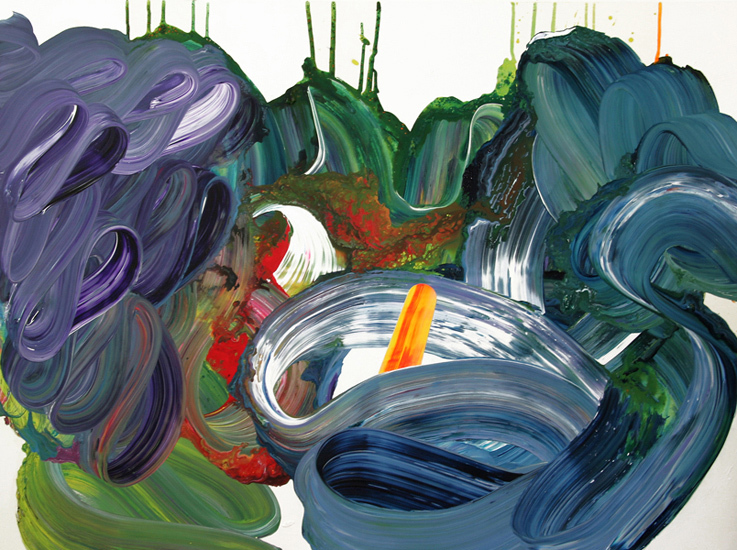 I first came across Yago Hortal one lazy afternoon, scrolling through Tumblr after a long shift working at Starbucks. Weary from a full eight hours of no colors except for the warm browns and bland whites of coffee and frothed milk, I was caught off-guard by the swirling, Day-Glo greens and neon pinks present in KF23. The application of the paint and the overall execution of the piece remind me of the works of the Abstract Expressionists I admire so much, particularly Helen Frankenthaler’s vast and vibrant splatters of paint. The rainbow color scheme is something along the lines of Lisa Frank on acid. It was love at first sight. It is much harder to find any form represented in V12, an earlier piece from Hortal done in 2006. This work, though its color scheme is much different from KF23, still shares much in common with his later work. The DayGlo 1980s color scheme is gone; Hortal uses a very de-saturated color palette in this piece, save for the pop of red and yellow in the center. However, the paint is still applied to the canvas in a combination of free splatters and deliberate streaks of marbled shades of blues, purples, and greens. Hortal’s entire body of work can be viewed on his web site, and he maintains a blog, though it is in Spanish and may require the use of an online translator if you do not speak the language.